As promised in my Galentines Day post, todays upload is a review of two products from the Bomb Cosmetics Watercolours range! I must say, I’m so extremely happy that Bomb have brought this range out. Every release they come up with just seems to get better and better and this has got to be one of my favourites yet. The two I’ll be reviewing today are Fizzy Rascal and A Star Is Born, probably the funkiest shaped ones from the range. Fizzy Rascal is in the shape of a bomb and has the words ‘THE BOMB’ printed into it. The scent is lovely and fruity and this Bomb Cosmetics watercolours bomb contains grapefruit and mandarin essential oils which are perfect as a wake-up call! Theres also a novelty fuse coming out of the top with a gold and glittery tip which really adds to the aesthetic of it. 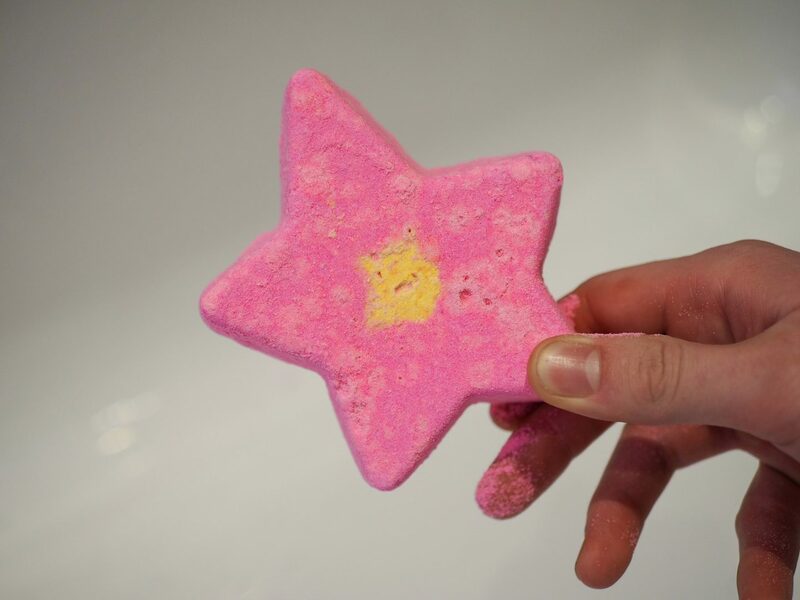 Upon placing it in the bath, it immediately starts fizzing away (perfectly named, clearly) and releasing some bright colours into the water. The great thing about the Bomb Cosmetics watercolours range is that they also have ingredients in that create bubbles so it’s like a two in one product! 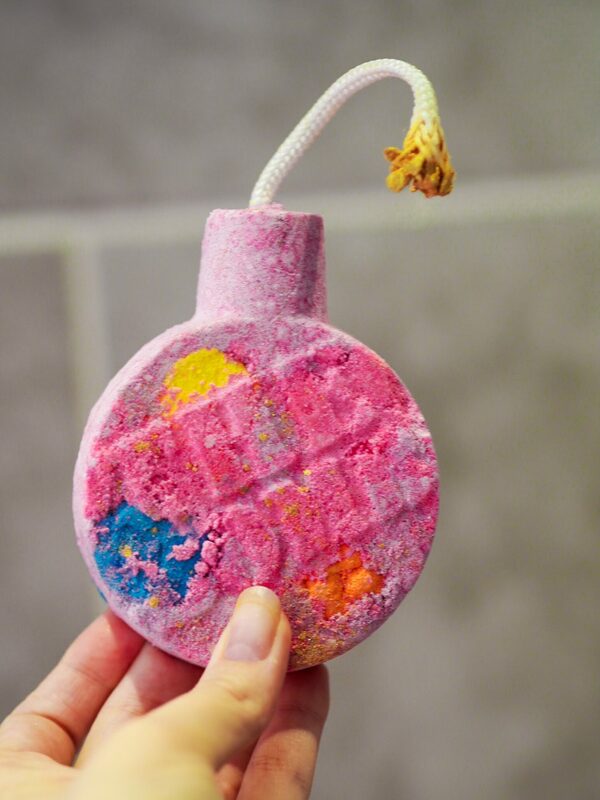 The bomb also releases a subtle fruity aroma as it’s dissolving and is consistently releasing bright coloured foam until it’s fully disappeared. As for how it helps the skin, it doesn’t contain a chunk of cocoa or shea butter like some of their bombs do so it doesn’t leave that super soft layer behind. However, it definitely leaves you with a subtle silky feeling and like your skin has been lightly nourished. I absolutely LOVE the shape of this one. I had to get it as I really adored the film and doesn’t it just look super fabulous? I did say it was more of a muted fruity scent in my last post but once it’s in the bath, there’s nothing muted about it! It has such beautiful fruity notes with a definite hint of a musk-like scent. The essential oils in this one are sandalwood and ylang ylang! I was only expecting pink and a little bit of yellow to emerge from this bomb but I was very pleasantly surprised when watching it unfold and dissolve into the bath. It released pink initially, then yellow. But then out came green, blue, purple and orange! It turned the bath into such an amazing little artistic haven. This bomb gets a full 10 for the surprise colours and just the wow factor overall. I imagine this will be my favourite of the Bomb Cosmetics Watercolours range although I still have a few left to try! As for feel on the skin, it’s the exact same as mentioned above in that it’s not extreme in the area of moisturising but just provides that little bit of silky nourishment. Have you tried any of the Bomb Cosmetics Watercolours range yet? *This post contains gifted items for the purpose of promotion but all views are my own. 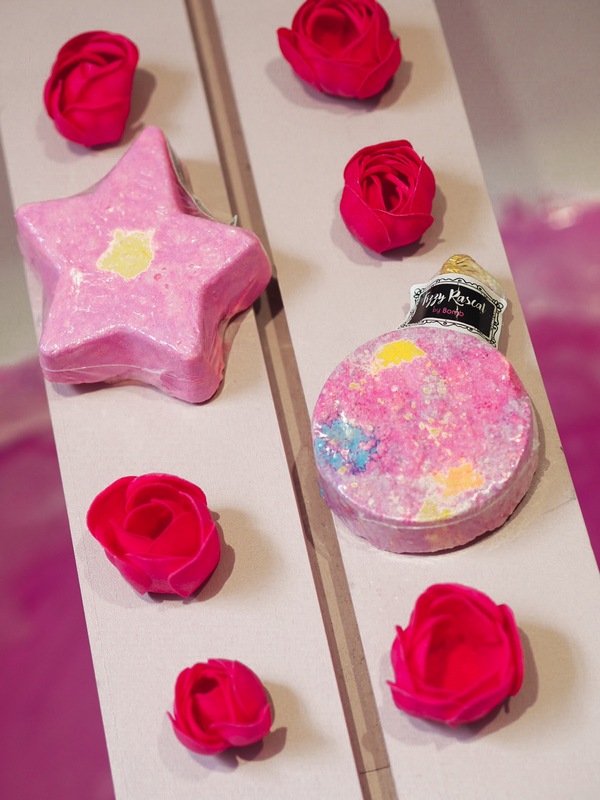 Goodbye To Boring Baths With Heavenly Bubbles! Bomb Cosmetics Raspberry Shower Butter! "The Stoma Series: 6 Months With A Stoma!" "Tips For Your First Blogging Event!" Oh my gosh they’re so beautiful! Not only that they both sound like they’re gonna smell amazing! These look absolutely amazing! I love the surprising colours from the A Star is Born product, I also love the film too! They are so festive and we all love color so this is amazing! I will have to check these out I’m sure my niece would love this. Fizzy Rascal is SO cool, from the name to the actual design. I can already tell I’d love the smell of it as I’m a sucker for anything fruity. A Star is Born looks super cool when it’s dissolving, how pretty! I always find it so clever how some bath bombs look like an actual work of art when they’re fizzing away. It’s been ages since I’ve had a bath as I don’t have one in my new house, this has made me really want a nice soak with a good bath bomb. I can’t wait to see the rest of the watercolour range, what an amazing idea for a range.